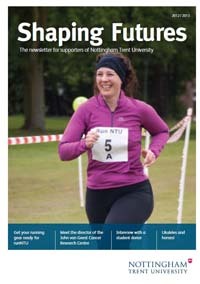 Thank you for your interest in making a donation to Nottingham Trent University. There are a number of priority areas in which we would appreciate your support. To learn more about how your gifts make a real difference, download our newsletter for donors, Shaping Futures, or read news specific to our Alumni Fund. The University welcomes regular giving by Direct Debit. Giving on a regular basis allows you to budget your support and spread the cost over a longer period while significantly contributing to the University. For online donations please select Give now and you will be directed to our secure online giving facility where you can choose 'Recurring gift' to set up your Direct Debit instruction. If you would prefer to donate by post, please download this donation form and complete the Direct Debit section (our full return address can be found on the donation form itself). Please identify on the form the project you wish to support: Alumni Fund general projects, Alumni Fund scholarships, Art and Design 170th Fund, Birds of prey conservation, Brackenhurst projects, Cancer research at NTU, David Richmond Memorial Fund, or Friends of Nottingham Law School. Alternatively you can call us on 0115 848 8810 (for major gifts) or 0115 848 8807 for all gifts associated with the Alumni Fund. A single gift can be made by cheque or credit/debit card, either by post or online. For online donations please select Give now and you will be directed to our secure online giving facility where you can select 'One-time gift' to make your donation by credit or debit card. If you would prefer to donate by post, please download this donation form and complete the Single Gift section (our full return address can be found on the donation form itself). 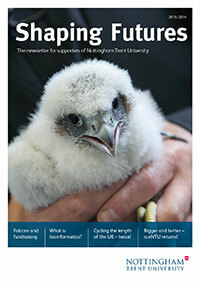 Please identify on the form the project you wish to support: Alumni Fund general projects, Alumni Fund scholarships, Art and Design 170th Fund, Birds of prey conservation, Brackenhurst projects, Cancer research at NTU, David Richmond Memorial Fund, or Friends of Nottingham Law School. If you pay income tax or capital gains tax your gift can go further via the Gift Aid scheme. You simply have to have paid tax at least equal to the sum we are reclaiming (currently 25p for every £1). Higher rate taxpayers can also recover the difference between the basic and higher rate of tax. If you are a UK tax payer, be sure to tick the Gift Aid box on the donation form. Legacies are the perfect way to make a lasting contribution to the success of your University and help future generations of students and they are free of inheritance tax. They don’t have to be large amounts of money or valuable assets – modest amounts are just as important. For further information about how to make a gift of this kind, please read more here, or contact us on 0115 848 8772. Donations of shares are exempt from Capital gains tax and bequests of shares are exempt from inheritance tax. Individual donors who make a gift of shares to the University can also deduct the market value of those shares from their taxable income. Telephone 0115 848 8810 for further information.